Unfortunately Vespera's Falafel has permanently closed. I will leave this page open for posterity, and in case the owner hopefully reopens (he has closed and re-opened in the past). An advertisement for vegan food is always a good sign! The original Vespera's Falafel closed down at its previous location after the owner was unfortunately hit by a car, but he's now recovered and re-opened his store in Koenji. I found it on Happycow, and decided to make the half-hour trip from where I was staying in search of Tokyo's newest falafel eatery, and it was my best find in months (thanks Happycow!). Unfortunately it'll be a while before I make it back since I'm leaving Japan soon, but Vespera's Falafel should top any travellers list, and if you live in or around Tokyo, I recommend it as a great place to go for delicious, affordable meals and a pleasant and interesting place to hang out. I was amazed to find myself the only customer on a Saturday night, though I guess that's to be expected for a newly-opened restaurant in a quiet suburban location. Not just falafel: This Pad Thai was the best I've had outside Thailand. While Vespera's namesake falafel was fresh, crispy and delicious as falafel should be, it turns out that this restaurant isn't just about falafel. While the menu is predominantly Middle-Eastern, it offers an expanding range of other international cuisines. I enjoyed a falafel wrap, fried potatoes (chips) with a delicious chilli seasonings and the best Pad Thai I've had outside of Thailand. 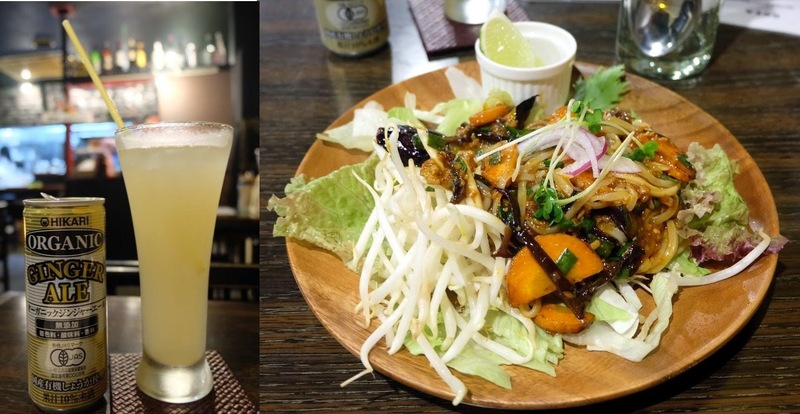 They serve a range of alcoholic and non-alcoholic drinks, including organic ginger beer. They have an English menu and the friendly and helpful waitress spoke fluent English. Japan) and these were the best I've had anywhere, owing to their fresh, spicy seasoning. The vegetarian owner, Eiji, is passionate about serving healthy vegetarian food at affordable prices, and that he certainly is: At 650 Yen for a falafel wrap or 500 Yen for a Pad Thai - both prepared cooked perfection - prices are incredibly low for Tokyo, especially for such quality vegan food. Two dishes, fried potatoes and a drink came to 2000 Yen. Vespera's Falafel has a very pleasant dining interior. Vespera's Falafel has a very pleasant, spacious dining area, which includes western-style tables and traditional Japanese low tables on a raised platform (for which shoes should be removed). There's also a table selling a few local and imported vegan groceries, most of which I haven't seen for sale anywhere else in Japan. I bought some vegetable crackers to snack on when I can't make it to vegan eateries. me of similar crackers available in convenience stores all over Taiwan. The inspiration for Vespera's Falafel comes from Eiji's visits to Inforshops in Europe, while touring with his band. Infoshops are centres for the distribution of information and social and political ideas, including alternatives to capitalism and the current consumer-oriented society, and often animal rights. While anyone with any background in grassroots activism, punk culture or anarchism will undoubtedly appreciate some of the posters and books tucked away on a corner bookshelf, Eiji is quick to point out that his restaurant is first and foremost a vegan restaurant, and for anyone not interested in this subculture it will appear to be no more than a light, pleasant touch of alternative decor. 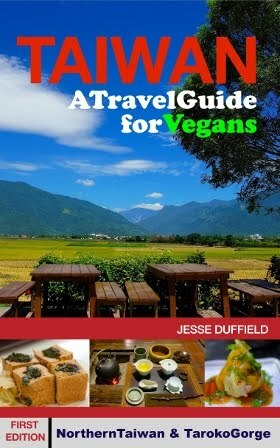 The balance is struck perfectly, with alternative information available for anyone interested in it, but a stylish vegan restaurant with delicious, healthy, affordable food for everyone else. Koenji Station area would be very pleasant if it wasn't used primarily as a smokers lounge. Vespera's Falafel is a 10 minute walk from Koenji Station, which is itself 10 minutes from Shinjuku Station on the Chuo Rapid train. Koenji (Wikipedia) is considered to be the centre for underground or alternative youth culture and music in Japan, and in particular it is said to be the birthplace of punk culture in Japan. It also boasts parks, temples and interesting shopping arcades, including a large number of second hand music and clothes stores. Also within walking distance are Meunota (also good, and I intend to post on it soon) and Poleyale (vegetarian) which I haven't tried (links to Happycow). I recommend visiting Vespera's and another cafe for lunch and dinner, and in between times exploring this interesting suburb of Tokyo. Hours (from Happycow): Wednesday - Sunday 11AM - 11PM. THIS IS GREAT! Hopefully someday I can go!